A conversation with the Director of energy programs of the Nomos center Mikhail Gonchar. -- From the very beginning let’s explain what is Southern Gas Corridor? Which specific gas transporting project it includes and which is the progress within the achievement of the main objective – options for the transportations of energy resources to Europe? -- Southern Gas Corridor is designed for all potential gas flows, which are possible to obtain and transport through the territory of Turkey to Europe. We are talking about gas supplies from Azerbaijan, Turkmenistan, Iran, Iraq and in more distant prospect – from Egypt, of the total scope of 60 billions cubic meters. The hoop of the Southern Gas Corridor includes Nabucco, the interconnector Turkey – Greece- Italy (ITGI) together with Trans-Adriatic gas pipeline (TAP), ”White Stream”, Transcaspian gas pipeline, and also Iranian and Iraqi connectors for gas supplies to Europe. Basic project of the Southern Gas Corridor is considered to be Nabucco as the most advanced and prepared for the further accomplishment, as the Nabucco Consortium established in 2004, by the moment has done a serious arrangements and organizational work. One of the main factors for the benefit of this project is a pretty consistent support by the European Union. At the moment, it has mobilized all its efforts to support exactly Nabucco, as it is called to become a pilot project of success of the EC and developed by its concept of single energy policy of the European Union. -- Although unique energy policy of the European Union, unfortunately, still exists on paper. -- There is no single voice in Europe yet. This is the main weak point of the Nabucco project, and the Southern Gas Corridor in general. Indeed, the project was defined as a priority for the EU. But not all the member-states support it in reality, but not declaratively. No one opposes, but by there is a number of states positioning themselves as the participants of Nabucco as well as the participants of the ideologically opposite Russian project the “South Stream”. And the European Committee, unfortunately, doesn’t have the kind of mandate, for all its decisions and recommendations automatically would be obligatory for accomplishment by the member-states of the European Union. That is why Nabucco is promoted by the group of companies from the EU member-states plus Turkey by the support of the European Committee. But the main players from the EU members have their own priorities. -- For one part Nabucco is not the main one, others are indifferent, another part is engaged with Russian projects. It’s understood that the project will prevail which will be initiated and supported by the gas-owing company, with more close relations – I mean “Gazprom”. That is why Nabucco promotes so complicatedly. As for the interconnector Turkey – Greece – Italy and Trans-Adriatic project, than although these gas pipelines technologically form a logic net of gas supply to Southern Europe, but they don’t have the kind of mobilization level of readiness for the accomplishment, as Nabucco. But now definite involved parties try to boost exactly Adriatic vector of the South gas corridor development. Why does it happen this way, we’ll discuss a bit later. -- Further – the "White Stream". Lately little has been heard of it. -- Unfortunately, its status hasn’t increased. Mainly it is connected with the fact that often this project is observed as a competing with Nabucco, although this is not true. In reality it is a complementary, peculiar North-West branch of Nabucco. Due to a permanently indefinite line of Ukraine the accomplishment of this project within Ukrainian direction is virtually frozen. International company White Stream Pipeline Co. redirected the project towards Romania. And this means the longest marine part of the gas pipeline (1105 km) in comparison with the “South Stream” (900 km) or the “Blue Stream-2” (444 km), maximum depth of piping (2 km) and respectfully the sophistication of the project’s economy and its further prospects are not clear. "South Stream" – Killer for Nabucco! -- By this the Achilles’ heel of the Southern Gas Corridor is the resource base. -- Naturally, the most successfully this integrated project, and primarily its vanward element of Nabucco, would advance towards accomplishment, provided the issue with Iranian gas supplies solved. But in respect that the EU as well as the USA took a special position towards Iran like the suspension of cooperation within energy sphere because of its nuclear program, the promotion of other projects that are not connected with Iran has intensified. Iranian gas could play a role of a booster for the Southern Gas Corridor development in general, but unfortunately Iranian political factor played an opposite, slow down role for Nabucco. -- But it doesn’t mean that Iranian gas was backstaged for good, does it? -- It can be included into Nabucco with two intermediate operations. Firstly, under the scheme of substitution of Turkmen gas. Turkmen gas earlier was supplied to Iran, and it’s well-known that Turkmenistan and Iran last year increased the capacity of the gas pipeline, connecting these two countries. Secondly, Iranian gas can be supplied to Nabucco through Azerbaijan and Georgia via the existing gas pipeline Iran – Astara – Gazakh (since the times ofMohammad Rezā Shāh Pahlavi 1971) first to Azerbaijan and than switching to the acting South Caucasus gas pipeline Baku – Tbilisi - Erzurum. Moreover Azerbaijan put all efforts to rehabilitate the pipeline system constructed in 70-s of the previous century. The gas pipeline exists and can operate. At least, the scope of gas supplied for Nabucco could comprise up to 10 billions cubic meters annually, which is quite adequate number for the first stage of this project of the total capacity of 31 billions cubic meters per year. By this everybody keeps their political images. The EU doesn’t work with Iran directly, not deviating from its line of the Teheran nuclear program rejection, doesn’t contradict the USA. Azerbaijan and Georgia don’t purchase Iranian gas, but only provide transit services. By the way, it’s worth to note that the relations in the triangle Teheran – Baku – Tbilisi in 2010 were marked by increased intensiveness of contacts at the top level. The second factor which can impede Nabucco accomplishment is the attempts of lobbyists of gas monopolies to “push forward” ITGI and TAP ahead of Nabucco. This is also assisted by the line of Norway company Statoil, which together with BP develops Azerbaijani field Shakh-Deniz and is included into the list of share-holders of TAP, which by the way, German E. ON. Ruhrgas wished to join. Norwegians successfully extend their gas market in Europe and firmly took its second place following “Gazprom” among the suppliers to the EU, using the mistakes of Russian monopolist trying not to permit the occurrence of “extra” gas in the center of the continent. Final point of Nabucco is hub Baumgarten in Austria, taking one of key positions for gas trade in Europe. The occurrence there of an additional offer of Nabucco resource can seriously reduce gas prices. From the interview of “Gazprom” Chairman Alexey Miller for Der Spiegel magazine. -- We learned that a price is defined by the correlation of demand and supply. А.Miller. – Things that we observed during financial crisis have never been taught. The world, and in particular Europe, shaked as much that they can’t still come to life. Obviously your teachers weren’t that good. -- This is good for consumers but evidently suppliers and sellers of gas, including German ones, wish to avoid it. -- And also the third factor, risk factor is related to that the track of pipelines, which should assure the supply of gas resource to Nabucco, lie within not enough stable area of Southern Caucasus, in particular within Azerbaijan and Georgia, where there are serious frozen conflicts which are able “suddenly” to defrost. This in its turn, increases political risks of Southern Gas Corridor projects. It’s enough to recollect in this context the event of August 2008. Of course we shouldn’t drama this risk factor, but it’s also dim-sighted to underestimate it. As a whole number of acting and designed ways of energy transportation lie within the territory of the states and regions with high political and military resources. In this sense we can remember West Africa, Iraq-Turkey oil pipeline Kirkuk-Ceyhan... The fourth factor influencing the Southern Gas Corridor in general and Nabucco in particular – is the covered counteraction of the Russian Federation and “Gazprom” which “push forward” the accomplishment of their own diversification project – the "South Stream". -- By this each of the companies and each EU member-state have their relations with “Gazprom”. At that, the scope of their relations with “Gazprom” in money equivalent increases so to say that level of energy dependence, that they would be able to reach in case of Nabucco project accomplishment. This is a grave internal slowing factor for the EU. This also causes such slow perception of the European Committee policy towards Nabucco. -- Although lately Russia hasn’t declared its non-perception of the Nabucco project, and says as if Nabucco doesn’t possess resource basis and thus it has no prospects. I’d like to draw you attention to the fact that the “South Stream” is the killer for Nabucco! Even regarding the key dates: the “South Stream” was founded right after the establishment in 2004 of Nabucco Consortium, which by 2007 gained good initial dynamic. On June 23rd 2007 “”Gazprom” and Eni signed a Memorandum of mutual understanding on the “South Stream”. This can be considered asa starting point. And on January 18th 2008 in Swiss Canton Zug (since 2004 a well-known and “dear” for each Ukrainian “RosUkrEnergo” has been operating there) Italian Eni and Russian “Gazprom” founded the South Stream AG company for the accomplishment of the “South Stream” construction. And now the main thing: Nabucco destroys Russian strategy aimed at the creation of a mechanism for transnational manipulation of the ways, flows and prices on exporting gas. If “Gazprom” will have “North Stream” and the “South Stream”, and to the existing pipeline Yamal – Europe and 50% in hub Baumgarten the control over GTS Ukraine will be gained – it will obtain a perfect system for Pan-European gas manipulations. And Nabucco, not controlled by “Gazprom”, with theoutlet in Austrian hub will assure high competition. “Gazprom” resource with a big share of probability will turn uncompetitive, considering its tradition policy of maximization of export prices. But Nabucco with gas resources, not controlled by “Gazprom” (Azerbaijani, Turkmen, etc) means that European purchasers will have the possibility to play not following the rules of “Gazprom”, but according to the rules of a competitive market. That is why outside counteraction of “Gazprom” the Russian Federation is aimed to any cost to impede Nabucco project accomplishment, even if verbally they express neutral or ignoring evaluations. -- Right. And we should include the factors of outside influence: not only the effect of “Gazprom”, which has been trying to buy maximum gas from the Shakh-Deniz field during the late three years, but also the counteraction of Norwegian Statoil, which was mentioned above. It is this company that lobbies actively the development of ITGI and TAP instead of Nabucco. At first glance this looks odd, but the motivation of Statoil is similar to the “Gazprom” one – not to allow surplus gas in European market. That is why Norwegians make attempts to lead potential surplus gas from Nabucco to South Europe, to Balkans, Italy, avoiding Austria from where it can automatically get to the markets of Central European states. This is another intrigue of the last period of counteraction to Nabucco, which becomes more evident. Norwegians here can hardly be blamed, as Norway is not the EU member and it is not obliged to lead energy policy in accordance with the demands of Brussels. -- Considering Norway factor Nabucco has turned out to be in quite a complicated situation. And for its safe it required an emergency interference of the EC and the unprecedented visit of the EC Head together with the European Commissioner on energy issues to Baku and Ashgabat. -- This is a right but a bit delayed step, as in the kind of situations one should act fast, decisively and rigidly. Unfortunately this has never been a peculiarity of Europeans. In comparison with the period of the accomplishment of the pipelines Baku – Tbilisi – Ceyhan and Baku - Tbilisi – Erzurum, which were strongly supported by the USA, thanks to which they were carried out, Nabucco doesn’t possess the kind of support due to the lack of unique voice within the EU energy policy. And the European Committee is forced to do the utmost not only to save the project but also to promote it. -- Let’s analyze, why exactly in the beginning of 2011 they have started actively talking about the possibility to converge and even substitute Nabucco with the South Stream project promoted by Russia? Which are the reasons for that to your mind? And what can this mean for the main parties supporting the named projects: for Russia, the EU, for potential gas buyers in Europe? And individually for Ukraine? -- Already in 2009 they first sounded the possible scenario of convergence of the two projects – Nabucco and the South Stream. It was intensified in 2010 because the both projects faced serious problems. The powers supporting this and that projects are not equal. The attempts of Russia to force the European Committee for the “South Stream” to be acknowledged as a priority for the European Union failed. Despite that since last year autumn the kind of attempts have been observed quite often and on various levels: the government, Gazprom, various working groups negotiations. Russia would like to gain the same status for the South Stream, as it used to gained with the North Stream, which became a priority within the frameworks of Energy dialogue of Russia and the EU. But the line of Brussels regarding priorities remains unchanged - Nabucco. That is why the “South Stream” in its essence remains to be a bilateral Russian-Italian project, which involves weak states of South Europe, as within their territories the corresponding tracks will lie, before the pipeline reached Italy. From the other hand, the problems of Nabucco were also evident - not everything went smoothly. That is why it is not an accident that first about the joining of Nabucco and the South Stream spoke Italians in March of 2010, which was immediately refused of by Gazprom. But by all ambiguity of the situation Nabucco gains a certain head start. The “South Stream” after the gas crisis, managed by Russia in January 2009 incited many doubts among Europeans. By the way note that this project is not supported by the kind of significant partner of Gazprom as Germany. Berlin doesn’t oppose the Southern Stream publicly, but it doesn’t support it unofficially. -- If there will be only the North Stream without the South one, then the scenario will be called “Russians captured by Germans”. As in this case gas can be supplied to Germany and Central and Western Europe following three ways – through the gas pipelines of the North Stream, Yamal – Europe and by Ukrainian-Slovak direction. And if Nabucco appears, that will be able to transport alternative Russian gas to the Austrian hub Baumgarten, this gas flow will reduce market prices within the states of the region, including also Germany. Thus it turns out that all named ways go to Germany this or that way. By the kind of scenario the play rules will be dectated by the market and consumers demand in Germany, as it is the biggest in the region. Not “Gazprom” will be able to push its conditions, but its old German partner. In case Russia would possess in addition to the North Stream also the South Stream the scenario will be called “Europeans captured by Russians”. As in this case Russians created a great transnational system to manipulate gas markets of the EU states and first of all the biggest of them, with all the consequences. That is why the idea of convergence of Nabucco and the South Stream in theory permits the both Parties to maintain their image and agree on “nobody won” within the pipe battle. Moreover, demonstration that a compromise of interests has been reached, etc. for each of the Party looked worthy (or to step out of the game, but this will depend on a case). In this sense the convergence of antagonist projects would mean a probable accomplishment of the second turn of the Russian Blue flow, till the joining the line of Nabucco within the territory of Turkey, and later on – following the ascribed way. Today the kind of variant of convergence of Nabucco and the “South Stream” seems as virtual. But each unlikely scenario has a tiny probability for its accomplishment. At this background typical is the line of Italy – main partner of “Gazprom” on the “South Stream” accomplishment. During last year they actively increased the purchases of non-Russian gas. Which doubts their readiness to end the accomplishment of Russian-Italian project, the prospects of which will not improve in case the Prime-Minister S. Berlusconi resigns. And even if he, just as a former German Chancellor G. Schroeder, will head the project, this will hardly stimulate its development. -- Naturally, Italians are interested in money from the budget of the “South Stream”. And who is not? As a rule, main lobbyists of the kind of projects are not gas companies themselves, but the contractors (builders, producers of pipes, engineering companies). -- It’s known that, Italians did greatly within the partnership with “Gazprom” on the accomplishment of the “North” and the “Blue Stream”. The main contractor on the sea piping was Italian daughter of Eni. It will also be involved into the “South Stream”. I.e. not even gas, but financial interests is observed among Italians via construction contracts. This case should be considered. -- Today we can definitely state one thing – the more successful will be the accomplishment of Nabucco or the related projects of the Southern Gas Corridor, the greater is the probability of provoking of various conflicts and even military incidents within this transport corridor. As the kind of situation incites grave counteraction from gas monopolist. -- And that is why the variants of the issue of projects competition solutions is either the EU forcing Russia to refuse of the accomplishment of the economically expensive “South Stream” or the convergence with Nabucco, with the implementation of win-win strategy: no winners no defeated. But … Russia has never been satisfied with the kind of strategy, it’s important for it to promote only its interests. Naturally a whole number of risks have been already calculated reliably and can be compensated. But this lies within surface. There is a number of other, not that evident scenarios of possible outside influence on existing vulnerable objects of the pipeline infrastructure, in order to break the plans of the new one construction. But this is an issue for another talk. -- So what is the meaning of all above stated for Ukraine? What should we learn and how should we act? And which results for us will be the accomplishment of one of these two scenarios -- "Russians captures by Germans" or "Europeans captured by Russians". By the development of any of the scenarios Ukraine will find itself within the area of “war actions” of these and those. But it can benefit only in one case. -- Which is the reason for me being pretty pessimistic about the issue of operation efficiency of the both flows – north and south ones. Because if all the projects are accomplished – the North stream and the South Stream and Nabucco, than in the essence, the priority position within the terms of competition of gas supplies will gain the way which will guarantee minimal expenses. And this will be Ukrainian way. To make sure of that, it’s enough to look at the map. From this view Ukraine is absolutely interested in the accomplishment of Nabucco project, as supplies will balance the huge demands of gas monopolists and their chasteners, which will be beneficial for traditional ways – via Ukraine and Slovakia. -- At the same time it explains why Russia and “Gazprom” need “rusty” Ukrainian gas pipelines. If they are so rusty and useless, why do they fight for them so?! -- Exactly. Of course because “Gazprom” as a monopolist can force Russian state to abolish export duty on gas, transported via the North and the South Streams. But … I’m afraid that this will not be enough: even in case of abolishment of the export duty the transportation tariff will be higher than by transportation of gas through Ukrainian GTS or Yamal-Europe pipeline. This explains the top interest of “Gazprom” to gas transporting systems of Belarus and Ukraine: they are also urgent to establish transnational system of supplies manipulation. And one can manipulate when he controls all the exits to the EU gas market, which is not integrated. In this sense Nabucco is beneficial for Ukraine, as it will force the supplier of gas to choose more economic ways of transportation in order not to be captured by Germans. And the most economic are the ways, lying within the existing system of gas pipelines with already compensated investments where there are pretty loyal transit tariffs. That is why tales that Nabucco will lead some resources of Central Asian gas from or around Ukraine to Europe – this is the kind of a bla-bla “Gazprom” propaganda. As firstly, looking at the geographic map (or the published scheme), we can observe that the shortest way between Caspian region and Europe corresponds to Nabucco track in its European variant. And secondly, in the result of the introduction of the schemes after “RosUkrEnergo” in due time Ukraine was simply deprived of Central Asian gas transit. -- And still if Nabucco will not be accomplished, and the two round flows appear? -- At the background of serious problems of such titan projects of the EU as unique European currency – Euro, the system of global satellite navigation “Galileo”, the European Committee has no right to fail with Nabucco and Southern Gas Corridor. Nabucco failure can become not only the symbol of European energy policy collapse, but the symbol of non-functionality of the European Union itself. Also the EU shouldn’t miss the possibility of inclusion of Ukrainian GTS under the control of Russian monopolist, as this will create a threat of escalation of price policy of Siberian gas export to Europe. For Ukraine and the EU it’s important to acknowledge another problem, which is not that public, relating it to naturally important but not complete issue of absence of gas transit scopes guarantee from the Russian Federation to Europe. Low level of transit load can lead to dysfunction of the Ukrainian GTS. The insufficiency of transit gas scopes will not allow transporting their own gas from the regions of Kharkov, Poltava and Suma via the territory of Ukraine. There will be no sufficient pressure assured to supply gas to Slovakia and further through hub Baumgarten to the EU states. The operation of Ukrainian gas “valve” will give Russian monopolist the possibility to create artificial deficiency (without provoking gas crises with no need) for them to compensate it via another way with higher costs. From the interview of the Chairman of OAO Gazprom Alexey Miller for Der Spiegel magazine (Germany), January 18th 2011. Der Spiegel. – Why do you construct the South Stream in addition to the North Stream – another pipeline between East and West – costing up to 24 billions Euro, via which starting from 2015 it is planned to supply gas to Europe through Black Sea? А.Miller. – the both pipelines absolutely fit our strategy, that by the way corresponds with the EU strategy – we are talking about gas transporting ways diversification. “North Stream” and “South Stream” are aimed at the establishment of additional gas transporting corridors to Europe. Yet 80% of Russian gas flows via the territory of Ukraine. There is a good Russian proverb: one can’t put all eggs into one basket. Der Spiegel. – We have the one also. And that is why Europeans support the alternative Nabucco project, which was also designed versus “Gazprom”. А.Miller – We do not at all oppose Nabucco. Der Spiegel. – Nevertheless you do everything possible to collapse its accomplishment. It’s supposed that “South Stream” and Nabucco will supply gas from the same region, from the kind of states like Turkmenistan and Azerbaijan. “Gazprom” purchases Azerbaijani gas more expensively comparing with the cost of the gas you produce in Russia. It seems that you are trying in advance not to allow the filling of Nabucco. А.Miller. – No, we do that, to assure the gas supplies to south of Russia, into the regions neighboring Azerbaijan. Gas from Yamal, from the north of Russia is more beneficial to supply not to the south of the country but to Europe. Der Spiegel. – It will be complicated for Nabucco Consortium to fill its pipeline, if you purchase all gas for the “South Stream” ahead of Europeans. А.Miller. – The same as in case with North Stream, first we sell gas and only then we produce it than transport. We do not compete with anyone for these 63 billion cubic meters for the South Stream. We only satisfy the demand of Russian gas consumers. As we’ll not build the pipeline at first, and than think what to do with the kind of gas scopes. Der Spiegel. 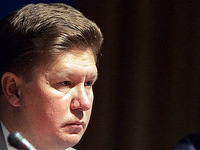 – For the “South Stream” and “Gazprom” it is not bad. But Nabucco remains with nothing. А.Miller. – If Europeans want than let them construct Nabucco. We don’t oppose. This is their problem. Our task is to supply gas to our consumers in accordance with our contracts.